AIR EMERGENCY RESPONSE 40 June/July 2018 unmanned systems inside charge of managing UAS f lights through the state operations center. Moore's team of pub- lic safety workers collected data on levees in Missouri City so officials could make sure they were holding and that unreachable pumps were still functional. "Since then the FA A has streamlined the process and we've gotten multiple emer- gency COAs in jurisdictions other than our own in East Texas," Moore said, noting the approval time typically takes an hour and a half, though some approvals have come in as quickly as 30 minutes. "That process was so frustrating at the time, but it's been resolved with a positive outcome. That makes a huge difference." A team from the Lone Star UAS Center of Excellence and Innovation at Texas A&M Photos courtesy of Airborne Response and EEI. Above: The view from a drone in Homestead, Florida. 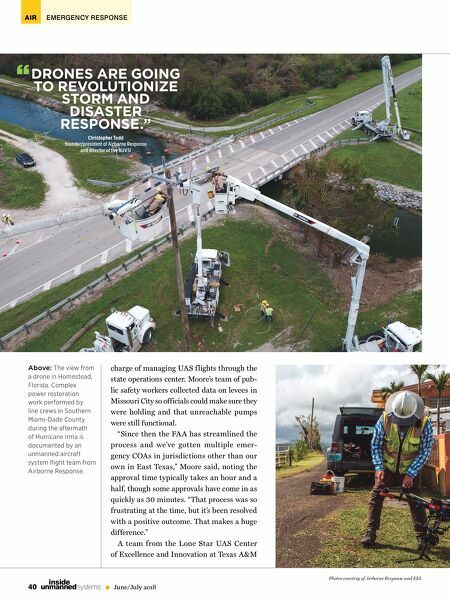 Complex power restoration work performed by line crews in Southern Miami-Dade County during the aftermath of Hurricane Irma is documented by an unmanned aircraft system flight team from Airborne Response. 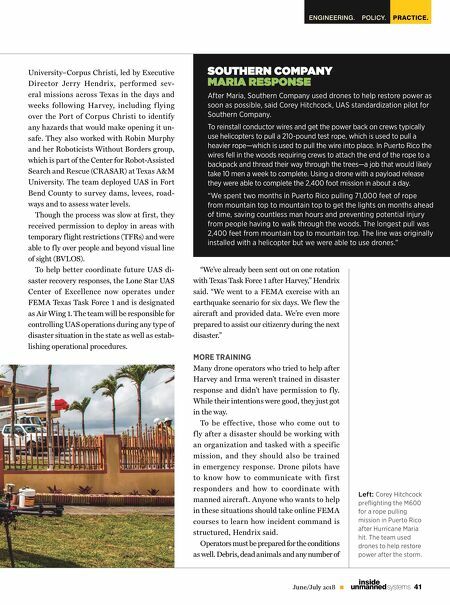 DRONES ARE GOING TO REVOLUTIONIZE STORM AND DISASTER RESPONSE." Christopher Todd founder/president of Airborne Response and director of the AUVSI "